12. 03. 2017 20:12 19 (5 - Neuville Thierry / Gilsoul Nicolas): I can only say I'm happy for the whole team, they kept pushing me. Thanks to them for sorting the car so quickly after the first day. I'm happy to be here. 12. 03. 2017 01:40 16 (5 - Neuville Thierry / Gilsoul Nicolas): My day has been good. Okay, maybe not the perfect tyre choice but I was in the position to try out a few things. Unfortunately the rain came too late for us. 12. 03. 2017 00:16 14 (5 - Neuville Thierry / Gilsoul Nicolas): I have only one tyre left on the car - a hard one - otherwise we couldn't do the stage. Ok, softs were not the best choice, but if it had rained maybe we could have taken time. I'm concentrating on driving smoothly and cleanly. 11. 03. 2017 23:54 13 (5 - Neuville Thierry / Gilsoul Nicolas): I had a good stage with the tyres I had on the car. A good stage, I must be pleased with it. 11. 03. 2017 22:07 12 (5 - Neuville Thierry / Gilsoul Nicolas): The car was sliding quite a lot. The time is not so bad. Ok, the hard tyre would have been better here my choice is a compromise for the whole loop. 11. 03. 2017 18:40 11 (5 - Neuville Thierry / Gilsoul Nicolas): We're trying a few setup things. On speed alone I can't catch the guys ahead but I can keep the pressure on. 11. 03. 2017 18:02 10 (5 - Neuville Thierry / Gilsoul Nicolas): A good stage, good rhythm and I'm enjoying it, but I can't catch the guys ahead unless them make mistakes. 11. 03. 2017 16:25 9 (5 - Neuville Thierry / Gilsoul Nicolas): The car is working well, so I hope we have identified the problem. The guys did a good job and the the car feels comfortable. Sometimes my notes we too slow, but no problems. 11. 03. 2017 03:58 8 (5 - Neuville Thierry / Gilsoul Nicolas): Frustrating yes, but we have the speed, and hopefully still third place overnight. Now we need to get working. We are still here. 11. 03. 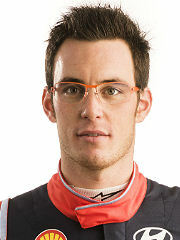 2017 01:58 6 (5 - Neuville Thierry / Gilsoul Nicolas): I have to push here - I want to try and get third place for tomorrow's road position from his team-mates ahead. Tomorrow should be a better day, the guys will work tonight to check the engine and I have learned a lot about how best to use the diff. 11. 03. 2017 00:58 5 (5 - Neuville Thierry / Gilsoul Nicolas): Towards the end I was sliding too much on the tyres. I tried. 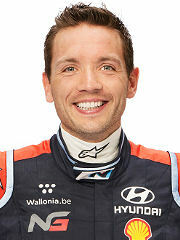 I can't explain my time on the first stage - I drove well but I must have lost a lot of power. 11. 03. 2017 00:18 4 (5 - Neuville Thierry / Gilsoul Nicolas): I didn't hit anything, but I was in trouble with the power. I have a small issue which we will solve now. Overheating. 10. 03. 2017 03:37 1y (5 - Neuville Thierry / Gilsoul Nicolas): A nice start. Ok, a bit unlucky with the rain on the first pass but this was a good run and the time should be good. 10. 03. 2017 02:53 1x (5 - Neuville Thierry / Gilsoul Nicolas): Now the rain is really coming down and making it very, very slippery. Unbelievable.